You may of have seen these amazing treats around the place, but did you know that these are almost a staple treat in Australia, can you guess what these are? 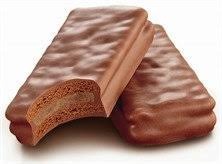 These delicious biscuits are called Tim Tams. Apparently these biscuits are so versatile that you can even make a cheesecake out of them. If you have tried these before, let me know what you thought of it.